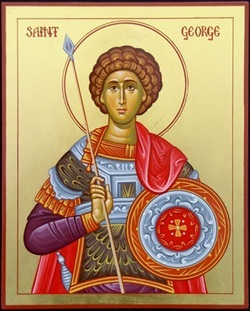 The Holy and Great Martyr George was born to devout parents in the late 3rd century. His father, an officer in the Roman army, was from Cappadocia, and his mother was from Lydda in Palestine. After the death of his father George’s mother relocated them to Beirut. When he came of age George followed in his father’s footsteps and joined the army where he quickly rose through the ranks. He gained the titles of tribune and comes or comites (count), and was a chiliarch, or commander of a thousand troops. During the reign of Emperor Diocletian (284-305) George learned of the planned persecution of Christians. When ordered to participate in the atrocities George confessed himself to be a Christian and criticized the imperial actions. This enraged Diocletian who had George arrested, imprisoned and tortured. George was beaten, placed under great deprivations, and various other torments that sought to break his body and will. Once, when he was being stretched upon a great wheel, an angel appeared to him and touching him cried out, “Rejoice, O George!”, whereupon his grievous wounds were healed. Dismayed, the jailers presented the renewed George to the imperial court where Diocletian was startled and supposed that he beheld an imposter or a ghost. However the torturers confirmed before all those gathered that this was none other than George the commander. Several of the court officials, who had kept their Christian faith secret, stepped forward and saluted George and glorified God, confessing their own faith in Christ. Diocletian had them beheaded immediately and returned George to the prison and further tortures. After some time, the emperor had George, once again healed from his injuries, brought forward. Diocletian sought to have one of the court magicians, a man named Athanasius, poison him. The magician gave the saint two potions, one a drug to sap his “powers” and make him physically weak, and the other a strong poison designed to kill George. When he drank them, however, George remained unharmed, and gave thanks to God, once more criticizing the Emperor’s efforts. On seeing and hearing George proclaim God openly and remain unharmed by the strongest of poisons Athanasius fell to his knees confessing his sins, and asked George to pray for him that God might find Athanasius worthy of the heavenly kingdom. Once again Diocletian’s answer was to behead the newly saved convert, as he had done before. Finally George turned directly to one of the idols and spoke to it as if to a living creature saying, “Are you the one that seeks to receive sacrifice instead of God?” The statue then spoke crying out “I am not a god, neither are any like me. The only God is the one whom you serve and preach. We are fallen demons, and deceive because we are jealous.” George then cried out with authority “How dare you remain here when one who is a servant of the true God enters. Depart!” The statues of the pagan gods began to screech and each in turn fell down and was destroyed. Seeing this the people rushed the good saint and tied him up and began to beat him. The Empress Alexandra, who secretly yearned to follow Christ, cried out, “O merciful God of George, help me for you alone are All Mighty”, and tried to make her way to the valiant young man. Reaching him she fell to her knees and confessed Christ. Diocletian seeing this had her arrested as well and sentenced both of them to be beheaded then and there. As they were taken out the empress fell faint and slumped against a wall and surrendered her soul to God. George prayed that he too could be found worthy in death. Having reached the place of execution George prayed for those who had tortured him, and who were about to behead him, asking God to forgive their sins. Then he calmly knelt down and bravely bent his neck accepting the end in peace on April 23, 303.